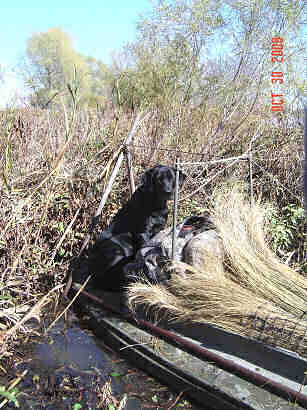 A blind is essential for successful duck hunting in most situations. It needs to be compact, effective and easy to erect. I have used several different blind set-ups. The blind system that has worked well for me includes using a specific natural grass. Spartina cordata has several common names including rippy, rip-gut, cordgrass and slough grass. This grass when cared for will last several seasons before it needs replacement. I take an old tennis court net and cut it in half lengthwise so I have two pieces that are approximately 2’ x 25’. The length of your net depends on the length of your cockpit and whether you are blinding in a dog. Use two pieces one for each side. I use 5" wire ties and separate the grass into bundles about the diameter of a quarter. 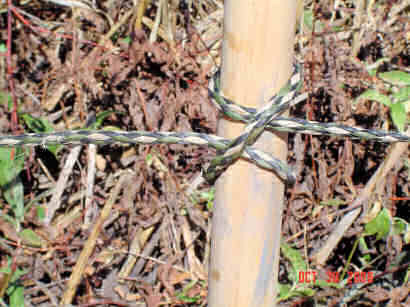 Weave the bundles into the net at the top and bottom and attach them to the net with another wire tie. I don’t attach bundles to every square on the net, but will skip two squares in seven. The nets will easily roll up for storage and transport. 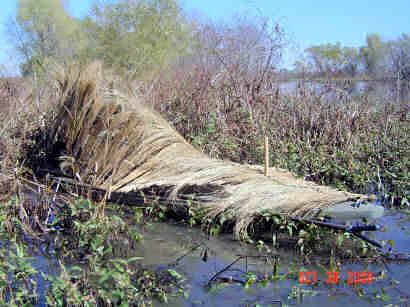 The next step in construction of your blind is building the frame work to support the nets around the cockpit when hunting. There are many ways to do this; use your imagination. I use five 3/8" dowel rods attached standing upright to the inside of the cockpit with conduit brackets (see photo). Use the brackets with two holes for attachment, the one hole brackets will not stay in place. The two rods at my shoulders are 36”, the two middle cockpit dowel rods are 18” and the one in the front is 12”. Take parachute cord and string around the dowel rods. Since I am a Boy Scout and an ex-Navy man I know how to tie a clove hitch on a bight. Ask a Boy Scout how to tie the clove hitch. It is the knot I use at each dowel rod. You will find the cord will need to be attached to the two dowel rods at the rear of the blind at shoulder level. The cord must then slant down as it goes to the front of the blind. This will allow you better visibility and ease of shooting. By the time the cord is at the front of the cockpit it should be as low as it can be. This will allow the blind to lay flat across the front of the cockpit. Blinding in a dog will take some experimenting. I drive a couple of stakes outside of the boat on each side and extend the net along one side and around the back. This will leave an opening on one side for the dog to exit. There are several factors involved in selecting which side the opening will be on. I don’t like the sun to shine in the opening. On a clear south wind morning the opening will be to the west and I will want to be south and a little east of my spread. Other factors involved include other boats in your party, other dogs in your party (and their level of boat manners), where the ducks actually want to land, and vegetation. Experience will help you decide. On cloudy days I always take extra time and use vegetation from the area to help my blind blend in. Contrary to popular belief it is easier to hide on sunny days than it is on cloudy days. The reason is the sun provides shadows and lots of contrast from a birds eye view. Whereas cloudy days provide little contrast. Spend a little time figuring out your blind system. It is time well spent. KARA Enterprises, 310 W. 8th St., Carrollton MO 64633. IF YOU FOUND US ON THE INTERNET, PLEASE LET US KNOW WHEN YOU ORDER.